With plenty of moving services, Meathead Movers is fully prepared to make Coronado your new home. Our clean-cut student athlete movers are dedicated to fulfilling all your moving needs efficiently. Coronado is known for its impressive architecture and the famous bridge connecting the city of over 24,000 to San Diego. A high concentration of young families makes this affluent city an ideal spot for couples who have kids. Top-notch public schools and exclusive private institutions offer families an opportunity to provide their children with a high-quality education. Many naval families also move to the city because the Naval Air Station North Island is the largest employer in the city. On top of great education and work opportunities there are plenty of fun opportunities for residents to take advantage of in Coronado like a top-rated beach, theater companies, and an enthusiastic Fourth of July parade and activities. The only downside to moving to Coronado is the hassle of packing up belongings and making the trek to a new city. Our Coronado movers provide extensive moving services that make relocating to the city a breeze. Meathead Movers is a full-service moving company that can cater to the needs of any client. Our moving company specializes in local, long-distance, and commercial moves to, from, and within Coronado. We also provide reliable packing, storage, and on-site relocations. 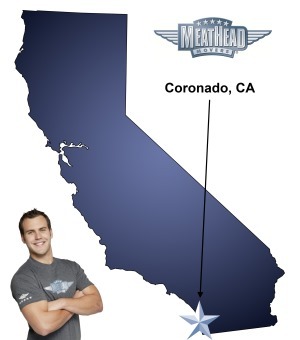 There are plenty of movers in California, but Meathead Movers is a step above the rest. We employ clean-cut respectable student-athletes who will always hustle for you. In fact, when not carrying your items they will jog to ensure a fast and efficient move. Our focus on customer service is apparent with seven-day support and a complimentary moving concierge service to connect you with local service providers. Moving to Coronado? Here are some helpful resources.